Longitude West from Grenwh. 89° 57' 45"
Latitude N. 38° 55' 19.6"
The mouth of the River Dubois is to be considered as the point of departure. Monday May the 14th 1804. Showery day. Capt Clark Set out at 3 oClock P. M. for the western expedition. one Gun fired. a nomber of Citizens see us Start. the party consisted of 3 Sergeants & 38 Good hands,  which maned the Batteaux and two pearogues. we Sailed up the Missouri 6 miles & encamped  on the N. Side of the River. The best authenticated accounts informed us, that we were to pass through a country possessed by numerous, powerful and warlike nations of savages, of gigantic stature, fierce, treacherous and cruel; and particularly hostile to white men. And fame had united with tradition in opposing mountains to our course, which human enterprize and exertion would attempt in vain to pass. The determined and resolute character, however, of the corps, and the confidence which pervaded all ranks dispelled every emotion of fear, and anxiety for the present; while a sense of duty, and of the honour, which would attend the completion of the object of the expedition; a wish to gratify the expectations of the government, and of our fellow citizens, with the feelings which novelty and discovery invariably inspire, seemed to insure to us ample support in our future toils, suffering and dangers. 1804 Monday May 14th  This day being appointed for our departure, from Wood River, a number of the Inhabitants (Americans) from Goshen settlement came to see us start for the Western Ocean; we got in readiness, at 3 o'Clock P.M. Captain William Clark, Three Sergeants and 38 Men, who mann'd the boat, and Two pettiaugers;  fired the Swivel from the Bow of the Boat; hoisted Sail, and set out in high spirits, for our intended Western expedition: we entered the mouth of the Mesouri River, having a fair Wind from So East, and Rain; we sailed up the said River about Six Miles, and encamped on the North side of it.— The River Misouri is about one Mile wide, and on the South side of it near its mouth is an Island and its waters are always muddy occasion'd by its banks falling in, the current Runs at about five Miles & a half p hour; the banks are very steep, and the bottom very muddy. Wood River lies in Latitude 38° 54° North & the mouth of the River Mesouri 38° 54 39' North & Longitude 112° 15 West from Greenwich. ONail 2 Carrits $1 dollr P. Gass G. for T.
Decemb Newman 1 Do. 50 Cents Jos. Field G. for T.
13. Here McKeehan inserted what was probably the way most Americans then pictured the regions beyond the Mississippi and its inhabitants. "A Journal of the Voyages and Travels of a Corps of Discovery, under the command of Capt. Lewis and Capt. Clarke of the Army of the United States, from the mouth of the river Missouri through the interior parts of North America to the Pacific Ocean, during the years 1804, 1805 and 1806. Containing an authentic relation of the most interesting transactions during the expedition,—A description of the country,—And an account of its inhabitants, soil, climate, curiosities, and vegetable and animal productions.— By Patrick Gass , one of the persons employed in the Expedition. With Geographical and Explanatory Notes by the Publisher." In Conformity to the Act of the Congress of the United States, intituled, "An Act for the Encouragement of Learning, by securing the Copies of Maps, Charts, and Books, to the Authors and Proprietors of such Copies during the Times therein mentioned" And also to the Act, entitled "An Act supplementary to Act, entitled, "An Act for the Encouragement of Learning, by securing the Copies of Maps, Charts, and Books, to the Authors and Proprietors of such Copies during the Times therein mentioned," and extending the Benefits thereof to the Arts of designing, engraving, and etching historical and other Prints." Of the various publications which unite amusement and information, few can be justly held in higher estimation than the Journals and Narratives of Travellers and Voyagers: and in our own highly favoured country, the diffusion of general knowledge, the enterprizing spirit of the people, their commercial pursuits and habits of emigration, render such works particularly valuable and interesting; while the vigorous and unrestrained mind of the free American, by amplifying and embellishing the scenes presented to its view, enjoys the choicest luxuries of the entertainment they are calculated to afford. If it is conceded that discoveries made in North America are more important to the people of the United States than those made elsewhere, it will not be difficult to shew that none could have been made of so much importance to them in any part of the world as in the large tracts of country through which the late expedition, under the command of Captain Lewis and Captain Clarke, passed. 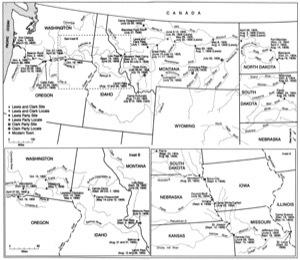 For if we take a view of the different discoveries and settlements previously made, we will find that those tracts through which the Missouri and Columbia rivers, and their branches flow, commonly called unknown regions, were the only parts remaining unexplored, which could be considered valuable. The first discovery of the Western World by Europeans of which we have any authentick accounts, being near the southern extremity of North America, drew, as might be expected, their attention to that quarter: and the rage which this grand discovery excited for other enterprizes of the same nature; the avidity, with which avarice was stimulated to seize the precious metals, known to exist in those parts; the means held out for gratifying ambition; and the prospects of a lucrative commerce, with many other objects and considerations tended largely to extend them; while the diminution of the Northern Continent to a narrow isthmus, and its large gulfphs, bays and rivers, furnished and facilitated the means of exploring it. The spirit of enterprize, however, was not confined to the southern extremity; but extending itself to the climates congenial with those which it had left, and connecting with its researches the planting of colonies, important discoveries were made along the Atlantic coast. In the mean time the project of discovering a northwest passage to the East Indies led the boldest naval commanders of Europe through the inland seas, bays and straights of the north; and at length produced surveys of the shores of the Pacific. To these discoveries, and those occasionally made during the settlement of the country within the limits of the United States, and in Canada, the Hudson's Bay company, though not famed for enterprize added something to the stock of general information, and by their establishments aided others in their enterprizes. Mr. Hearne under the direction of this company, in an expedition which lasted from the 7th of December 1770 to the 30th of June 1772, proceeded from Prince of Wales' Fort, on the Churchhill river in latitude 58d. 47½m. north, and longitude 94d 7½m. west of Greenwich, or 19d. west of Philadelphia, to the mouth of the Coppermine river, which according to some accounts is in latitude 72d. north and longitude 119d. west from Greenwich, or 44d. west of Philadelphia; but is laid down by others to be in latitude about 69d. north, and longitude 112d. west from Greenwich or 37d. west from Philadelphia. Whatever the confined views and contracted policy of the Hudson's Bay Company may, however, have omitted in the way of discovery, the enterprize and perseverance of the Canadian traders, sometime since united under the name of the North West Company, have amply supplied. Prior to the year 1789 they had extended their discoveries and establishments along the numerous lakes and rivers situated north of that high tract of country which divides the Mississippi and Missouri waters from those which run towards the north and east, to within a short distance of the Rocky Mountains. In the summer of this year Mr. McKenzie made a voyage from Fort Chepewyan on the lake of the Hills in latitude 58d. 40m. north, and longitude 110d. 30m. west from Greenwich or 35d. 22m. west from Philadelphia, by the way of the Slave river, Slave lake, and a river by which this lake discharges its waters (since called McKenzie's river) to the mouth of that river, where it falls into the North sea, in latitude 69d. 14m. north and longitude 135d. west from Greenwich, or 59d. 52m. west from Philadelphia. He again in the year 1793 penetrated from an establishment on the Peace river in latitude 56d. 9m. north, and longitude 117d. 35m. west from Greenwich, or 41d. 27m. west from Philadelphia, to the Pacific ocean in latitude 52d. 24m. north, and longitude 128d. 2m. west from Greenwich, or 52d. 54m. west from Philadelphia. By the discoveries alluded to, and those occasionally made during the rapid settlement of the country and the progress of enterprize, the principal divisions of this Northern Continent has been explored and become known. The line separating these from the parts which remained unexplored and unknown, may be considered as commencing at the Pacific ocean in latitude about 38d. north, and running along the high lands and mountains between the waters which fall into the gulphs of California and Mexico and those which fall into the Missouri river, and continuing in that direction to the Mississippi; thence up that river to the source of its highest north western branch; thence along the high tract of country which divides the waters of the Missouri from those which fall into Hudson's Bay and the North sea; from whence it will continue across the Rocky Mountains to the Pacific ocean in latitude about 52d. north. To the south of this general division line, the known countries will be Old and New Mexico and a part of Louisiana; to the southeast, West and East Florida; to the east, the United States; to the northeast, Canada, the Labrador country, part of New South Wales and of other countries round Hudson's Bay; and to the north, part of New South Wales, New North Wales, the Athabasca and other countries containing the establishments of the Hudson's Bay and North West Companies, and those explored by Hearne and McKenzie: leaving unknown and unexplored (except so far as the surveys made by navigators of the coast of the Pacific, and the imperfect accounts of traders who have ascended the Missouri have furnished information) all that large intermediate tract, containing in breadth about 1000 miles; and in length in a direct line, about 1800 miles, and by the way of the Missouri and Columbia rivers nearly twice that distance. This tract from its situation may be supposed to contain the chief part of those lands in the great western division of the continent of North America fit for tillage: and this circumstance will therefore in a special manner claim the attention of an agricultural people, render more interesting a description of them, and attach additional value to the history of the country. It will not be forgotten that an immense sum of treasure has been expended in the purchase of this country, and that it is now considered as belonging to the United States. Here at no distant period settlements may be formed; and in a much shorter term than has elapsed since the first were made in America, from which hath arisen a great, powerful and independent nation, the posterity of the present inhabitants of the Union may unfurl the standard of independence on the plains of the Missouri and Columbia. With respect to the accuracy of the relations given in the following pages, it may be necessary to inform those readers not acquainted with the fact, that the principal object in sending out the expedition was to gain some correct account of the country: and that this might be done more effectually, and the information collected, preserved with more certainty, it was enjoined upon the several persons belonging to the corps, who were considered capable, to keep journals, and every necessary information and assistance given them for that purpose: these journals were also from time to time compared, corrected and any blanks, which had been left, filled up, and unavoidable omissions supplied. By thus multiplying the journals, revising and correcting them, the chances of securing to the country a true account of the progress of the expedition and of the discoveries which should be made, especially should the party be attacked and defeated by the savages or meet with any other disasters in their hazardous enterprize, were also multiplied. The following is an extract of a certificate delivered by Captain Lewis to Mr. Gass, dated St. Louis 10th Oct. 1806. "As a tribute justly due to the merits of the said Patrick Gass, I with chearfulness declare, that the ample support, which he gave me, under every difficulty; the manly firmness, which he evinced on every necessary occasion; and the fortitude with which he bore the fatigues and painful sufferings incident to that long voyage, intitles him to my highest confidence and sincere thanks, while it eminently recommends him to the consideration and respect of his fellow citizens." In determining the form in which the work should appear, the publisher had some difficulty. Two plans presented themselves. The one was to preserve the form of a daily journal (in which the original had been kept) and give a plain description of the country and a simple relation of occurrences equally intelligible to all readers; leaving to every person an opportunity of embellishing the scenes presented to him in his own way. The other plan was to more fully digest the subject, make the narrative more general, and assuming less of the journal form and style, describe and clothe the principal parts of it as his fancy might suggest. However far the latter might have been proper had a foreign country been the subject, and the principal object of the publication, mere amusement, many objections occurred to it in the present case; and rendered the former the most eligible, especially as by it the climate and face of the country will be more satisfactorily described. And Mr. Gass having declared that the beauties and deformities of its grandest scenes were equally beyond the power of description, no attempts have been either by him or the publisher to give adequate representations of them. From Saint Louis, in the Territory of Louisiana and on the River Mississippi across the Continent of North America, by way of the River Mesouri, to the Pacific or Western Ocean; in the Years, 1803, 4, 5 & 1806, under the directions of Captain Merriweather Lewis, and Captain William Clark, and patronised by the Government of the United States, with a description of the Countries through which they passed; taken from actual survey. 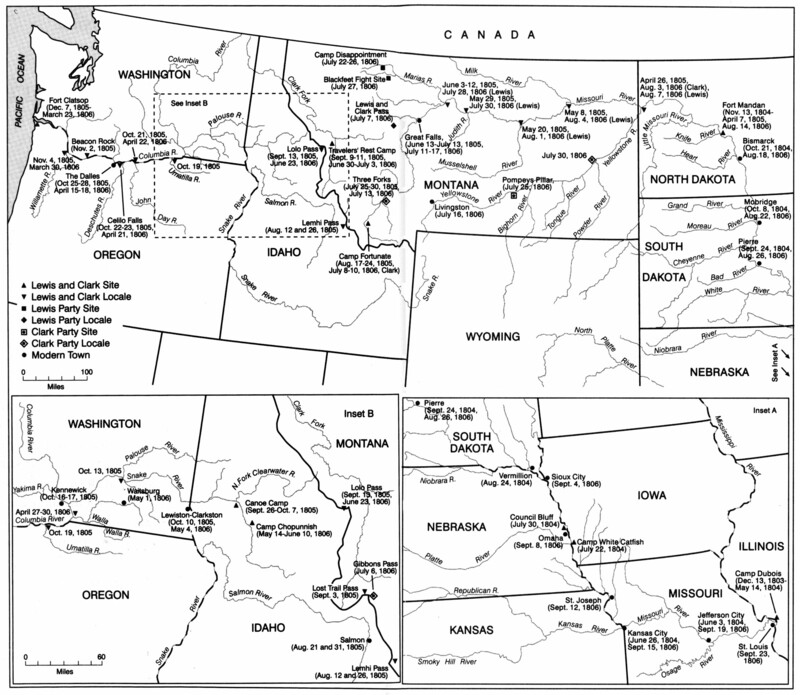 Illustrated with Maps, with an account of the Latitude [blank] of the most noted places on the Mesouri and Columbia Rivers, by. To The Citizens of the United States. On presenting this Volume to my fellow Citizens, it is not necessary to enter into particular account of this Voyage; but I trust that the generous public, will make such allowances as they shall think fit, to one who has never before presented himself to them in the character of an Author; for which the course and occupations of my life; has by no means qualified me, being much better calculated to perform the Voyage (arduous as it might be) than to write an account of it; however it is now offered to the Public, with the submission that becomes me. I was led at an early period of my life to enter into the Army of the United States, by views I had to acquire Military knowledge, & to be acquainted with the Country in which I was born; and accordingly was somewhat gratified by being ordered (shortly after I joined the Service) to Kaskaskias Village, in the Illinois Country.— I there, from frequent conversations, I had with Traders; whose traffic was with the Indians, residing on the Mesouri River, contemplated that there might be a practibility of penetrating across the Continent of North America, to the Pacific Ocean by way of the Mesouri River, but found from the most perfect account that I could collect from any of them; did not extend beyond the Mandan Nation, who inhabited on the same River Mesouri, which lays in 47° 24' 12 North Latitude; the Countries beyond that place, being utterly unknown to them, and even to the Indians inhabiting that Country. In this Voyage I furnished myself with books, and also got from Captains Lewis and Clark, every information that lay in their power, in order to compleat and make my Journal correct; and part of my Journals were kept by one of them when I was on a fataigue party.— This was done by them, in case of any great accident happening to the party, so that if any of them should return to the United States, or their Journals fall into the hands of any civiliz'd Nation, that the grand object of our discovery's might not be defeated. The object being accomplished, it lays with you to determine the practibility of a commercial communication across the continent of North America, between the Atlantic and Pacific Oceans which is proved by my Journal.— Nor do I hesitate to declare, my decided opinion, that very great, and essential advantages, may be derived; by extending our Trade, from one Sea, to the other. I am not a candidate for literary fame, at the same time, I cannot but indulge the hope, that this volume, with all its imperfections, will not be thought unworthy the attention of the scientific Geographer; and that by unfolding Countries; hitherto unexplored, and which I presume, may be considered as a part belonging to the United States, it will be received as a faithful tribute to the prosperity of my Country. Of a Voyage across the continent of North America, to the Western; or Pacific Ocean.